Pain has a purpose: it tells us when something's wrong with our bodies. Sometimes it's obvious, like a cut or bruise. Sometimes, though, it takes a bit of sleuthing to find out what's wrong. That can be the case with a toothache. One possible cause is perhaps the most obvious: something's wrong with the tooth. More specifically, decay has invaded the tooth's inner pulp, which is filled with an intricate network of nerves that react to infection by emitting pain. The pain can feel dull or sharp, constant or intermittent. 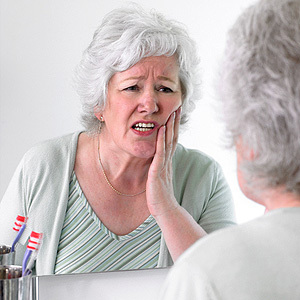 But decay isn't the only cause for tooth pain: periodontal (gum) disease can trigger similar reactions. Bacteria living in dental plaque, a thin film of food particles on tooth surfaces, infect the gums. This weakens the tissues and can cause them to shrink back (recede) from the teeth and expose the roots. As a result, the teeth can become painfully sensitive to hot or cold foods or when biting down. Finding the true pain source determines how we treat it. If decay has invaded the pulp you'll need a root canal treatment to clean out the infection and fill the resulting void with a special filling; this not only saves the tooth, it ends the pain. If the gums are infected, we'll need to aggressively remove all plaque and calculus (hardened plaque deposits) to restore the gums to health. To further complicate matters, an infection from tooth decay could eventually affect the gums and supporting bone, just as a gum infection could enter the tooth by way of the roots. Once the infection crosses from tooth to gums (or gums to tooth), the tooth's long-term outlook grows dim. So, if you're noticing any kind of tooth pain, or you have swollen, reddened or bleeding gums, you should call us for an appointment as soon as possible. The sooner we can diagnose the problem and begin appropriate treatment the better your chances of a good outcome — and an end to the pain.